Like you, AMWUA and its member cities already are working toward 2017 goals. At the same time, we're reviewing what went right in 2016. A look back provides a boost of confidence for us and we hope it will encourage you to get involved and help find ways to solve new and lingering water challenges. Here are a few examples of AMWUA’s work in 2016. Legislature: AMWUA helped raise awareness about two state Senate bills that threatened to weaken Arizona's requirement that new developments have a 100-year adequate water supply before building. Governor Doug Ducey ultimately decided to veto the bills. We also helped to stop or modify other bills that would have threatened the ability of our cities to deliver safe, reliable water. 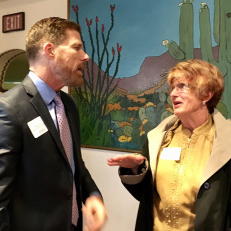 Just last month, AMWUA hosted a forum to inform lawmakers about current water issues and to explain the critical link between sound water policy and Arizona's economic future. Financing: In September, AMWUA partnered with the national Alliance for Water Efficiency to host a workshop that provided technical resources to help cities and private utilities develop and implement reasonable water rates. Reasonable water rates are fair to the customer, cover the cost of operating water and sewer systems, and promote conservation. In addition, AMWUA encouraged and participated in discussions to analyze financial issues impacting the Central Arizona Project (CAP) . CAP operates the 360-mile canal that delivers Colorado River water to Arizona cities. Understanding CAP’s finances helps the AMWUA cities prepare for future challenges that could affect the cost of Colorado River water they deliver to their citizens and businesses. Research and Analysis: In 2016, AMWUA provided cities and their partners with practical and useful research outlining immediate water issues, such as recovering and distributing the water that Arizona has banked in underground aquifers. AMWUA also acted as the eyes and ears for our cities and kept them informed about current and pending water issues. You’ll find AMWUA staff at every major water meeting, such as CAP Board and Committee meetings, Salt River Project (SRP) Board meetings and the Groundwater Users Advisory Committee. I also serve on Governor Ducey’s Water Augmentation Council. We’re working to make sure the state has the water it needs to serve its cities, small towns, agriculture and industries well into the future. Drought: The biggest ongoing topic among our city members – and all Arizona water professionals - for 2016, for 2017 and beyond is how Arizona can best respond to ongoing drought. The drought is affecting flows in the Colorado, Verde and Salt rivers, which supply the majority of Arizona’s residents with drinking water. Collaboration is the key to keeping our rivers healthy and our supplies reliable. In 2016, AMWUA regularly brought the cities’ water resource managers and water conservation professionals together with Arizona Department of Water Resources, CAP and SRP staff members to share information, challenges and ideas for solutions. Conservation: In 2016, AMWUA’s assistant director joined the Board of the Alliance for Water Efficiency, which advocates for the efficient and sustainable use of water throughout North America. AMWUA’s Board of Directors also adopted a resolution to support exempting conservation rebates from federal income tax, just as energy rebates are exempt. AMWUA sought help from Arizona’s congressional delegation, encouraged Arizona communities to join the effort, and coordinated with the national coalition working to address the issue. AMWUA also updated its Xeriscape: Landscaping with Style Guide and provided copies to its members to distribute within their communities. Partnerships: If anyone knows the benefits of collaborating to solve problems, it’s a 47-year-old organization that helps 10 cities work together to assure a safe and reliable water supply. That’s why AMWUA spent 2016 continuing to build strong relationships with the Legislature, the Governor’s Office, the Arizona Chamber of Commerce and Industry, the Greater Phoenix Economic Council, The Nature Conservancy, the AgriBusiness and Water Council, the Environmental Protection Agency's WaterSense Program and many others. You may know us best through this AMWUA Blog. Our readership is growing every year. We have spent much of 2016 working on a new website that will premier in 2017. Throughout 2016 we continued to keep you informed about regional, state and city water news through our Facebook and Twitter pages. In September, we also started having fun on Instagram, where we share water facts and useful tips with pretty – and not so pretty – pictures. Come take a look at amwua.arizona, #conservationculture. So, 2017 is going to be an interesting year for water. We’re hoping you’ll join us and use your voice to ensure safe, reliable water supplies remain at the forefront of policy decisions. We want our children and grandchildren to raise their families in a thriving state.